Being a teenager and trying to make it into the chaotic music industry, where sometimes one hit wonders are looked at over the better rounded and consistent artists, can be disheartening. In a world ruled by TV shows, where seemingly upstanding, ordinary citizens can chase their dreams of being a pop superstar, to try and set yourself apart from the rest can be tricky. Teenage superstars such as Justin Bieber, Taylor Swift and even Miley Cyrus have all shown that often the spotlight can affect you. There's one New York teenager however, that is trying to carve his own path into the music world, and he's doing it very efficiently; meet Jordan Bratton. The young New Yorker has already released a strong repertoire of tracks in the run up to his debut project The Grey Area, with his song "Danger 3" particularly catching our eyes here at EARMILK when we featured the track not so long ago. Well, two months later, we finally have the full album in it's entirety ready for you to stream and enjoy. The Grey Area is a 14 track free album from Jordan, and it showcases the enormity of just how diverse he can be. Right from the opening seconds of "Shakespeare" you get a keen sense of intrigue about Jordan's voice. With hints of the more recent Justin Bieber mixed with some of the complex melodies heard in the likes of Frank Ocean, the teenager delivers everything that influences him in even doses, meaning that his music doesn't get dragged down by mundane, similar sounding tracks. Instead, we're treated to a complete mixed bag of funky feet moving anthems such as "Midnight Rage", and slow, melodic songs like "No Sin Allowed" and even dark alt R&B jams in the shape of "Black Fever". With ever track being either self-produced or created by 88-Keys, it seems that there is no end to this young mans talent, as he's created some truly great backdrops to best show the range of his vocal talents. 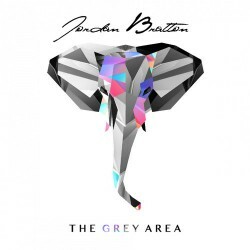 The Grey Area is a well-produced and polished project, that has an eclectic mix of different styles and vibes that showcase Jordan's extraordinary ability to keep his music diverse, whilst still maintaining the same breathtaking quality in every single of one of the songs he makes. You can stream every single track from The Grey Area in this post, and if you're feeling this project, you can download the whole album for free from Audiomack. With a lot of websites and blogs picking up on Bratton, and his buzz growing with each passing day, it's only a matter of time before we start seeing the young New Yorker's name up with some of the games biggest stars. Be sure to keep your eyes and ears locked onto EARMILK for any new music from Jordan, 2014 might just be his biggest year to date.